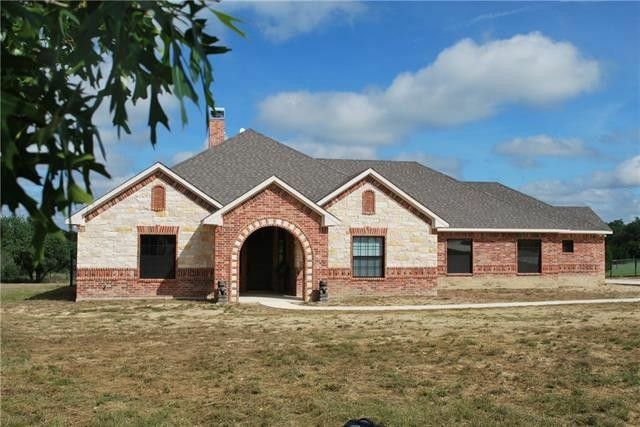 Unique Home on 2 acres! Living Area displays a vaulted ceiling with exposed beams, a beautiful stone fireplace and stained concrete floors. The Kitchen offers gorgeous granite counter tops, double oven, refrigerator, dishwasher, under counter lights, can lighting, custom cabinetry and a walk in pantry. Granite countertops in Bathrooms and Utility Room. Decorative lighting and custom cabinetry throughout the home. Master Bed has a Tray Ceiling and Crown Molding. Luxurious Master Bath with double shower heads in oversized shower, deep soaking tub, ceramic tile wood floors with enormous walk-in closet. Office with closet could easily be a fourth bed. Beautiful view of the countryside from large covered back porch. Directions: From Weatherford - North on FM 51 Turn left on Carter Rd. From Springtown - South on FM 51. Turn right on Carter Rd.Home on right hand side - look for sign.